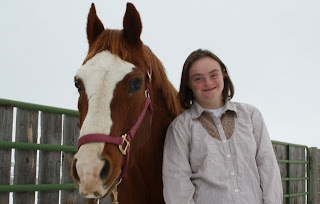 As the mother of a daughter with down syndrome, my life is much different than I imagined as a little girl. I dreamed I would have three children, two boys and a girl all perfect, all athletic and all smart. In real life I have three children, two girls and a boy, all perfect, all athletic and all smart. This realization that I was living my dream of the perfect family took a long time to embrace. When Alex was born, I felt different and my family felt different. I don't anymore, today I feel complete, and wonder why I was so graced with a child with down syndrome. Yes, my life is different than I dreamt, it is better. Blogging has enabled me to read about other Moms (and Dads too) across the world. I feel like we all have this enormous secret about the magic in our lives. Sure, there are medical problems and educational challenges, but in the end our lives are a journey of triumphs and challenges, life and magic. We live a life of awareness and acceptance. The gift of down syndrome. There are a number of blogs I follow regularly, and have added to my sidebar, and please let me know if you would like me to add yours. One of my favorites is by a very talented writer named starrlife. I found this post particularly poignant and bittersweet. On this Mother's Day, I would like to share this post of love, life and magic. I’m not sure about other parents but I know that I was not necessarily intended to be a parent. I was just over 40 when I had my first and only child. A planned pregnancy to be sure and unexpectedly enjoyable but childbirth was shockingly physical to me and early mothering, while gratifying in itself, had an impact on my previous sense of self that was traumatic and shattering. In that context, the news that my daughter was born with Down syndrome was actually not particularly difficult. I’m not comparing myself to others and certainly do not think that this is because I am some kind of a “stronger/better” person. And a Happy Mother's Day to all Mothers! Gary - that was very touching and so sweet! I sure hope to meet someday. What's going on with the idea of coming east? Hope you had a very wonderful mothers day!